What is luthiery? Luthiery is the art of stringed instrument construction. Now that we have that out of the way… Targets & Tuners is staffed by a Certified Luthier, who is also a current performing musician. Graduating in 1993 from Roberto-Venn School of Luthiery in Phoenix, AZ, Chris has performed countless repairs on acoustic and electric guitars and basses. Whether you need a set up, pickups replaced, or your favorite ax has a broken headstock, Targets & Tuners can get you playing again. Along with being a repair shop, we also are a dealer for brands like Aguilar, Bartolini, Digitech, Fralin, Jim Dunlop, Audere, and EMG. We can also get parts like pickups, bridges, tuning keys, etc. if you are the do it yourselfer. Want to increase your sustain and enhance your tone? Targets & Tuners is also an authorized FU-Tone installation center. Check them out – excellent gear. – also includes adjusting saddle heights and locations for best playing action and intonation. 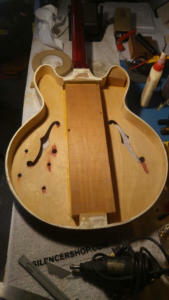 – adjust truss rod, as necessary. Replace tuners – $50 and up + materials. Fret Leveling (“Filing”, “Dressing”…) $100.00 and up. Worn or uneven frets can he filed level in many cases, if there will remain enough height on the fret to suit the customer (and practical playability). Frets must be lowered to the height of the lowest pit that can be found. Sometimes, replacing the most worn frets is appropriate. Includes “set up” adjustments. Re-fret $250.00 Add $50 for fret boards with binding or lacquered maple fingerboards. Individual frets $15.00 plus leveling and or set up costs in some cases. New nut or saddle may be necessary. Shop minimum may also apply. New Saddle- $50.00 may or may not include raw material. Same qualifications as with “new nut”. Re-glue bridge- $100.00 Remove and refit old bridge. Very minor touch-up included. (12 string bridge – add $25.00) . I want to thank you again for doing such a excellent job with my bass, I couldn’t be happier! This thing is killer, the tonal possibilities seem endless! Does your guitar need some work? Setup? Broken headstock? Electronics? Upgrade? Targets & Tuners has been doing this over over 23 years. Certified luthier. Work performed by musicians for musicians.